Shiro Games isn’t the type of game company to release tons of games that are broad reaching and cover many genres. This is kind of weird because in order to be proficient at making a game like Evoland 2($4.99), they have the chops to make a LOT of games. Unlike the original Evoland, the sequel fully explores several genres and manages a voice and a character all it’s own. While the first Evoland really never fully pushed past the big names that it pays homage to, Evoland 2 will draw you in and make you forget at times that it is in many ways an almanac of gaming nostalgia. Evoland 2 just recently released on iOS as a port from the PC version, and it is a really great way to play this enchanting game. The underlying plot of Evoland 2 is that you as the protagonist have been flung through time and must find your way back and of course go on many adventures, defeat foes and make friends along the way. The lionshare of the gameplay is still in the top-down view ala Secret of Mana or Legend of Zelda. Dungeons, Bosses, Puzzles and a slew of unique challenges all lay in wait to thwart your attempts to save the past present and future. 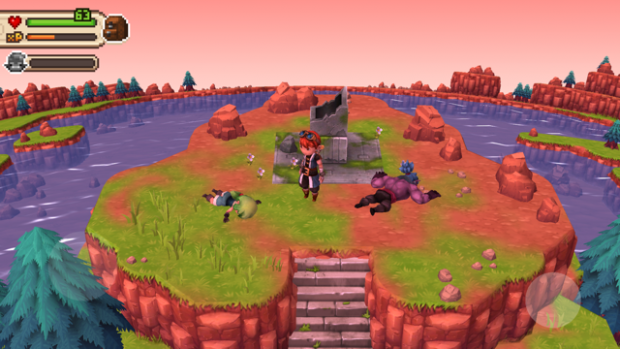 What sets the Evoland franchise apart is the fact that you won’t be playing just one genre of game or graphics engine. 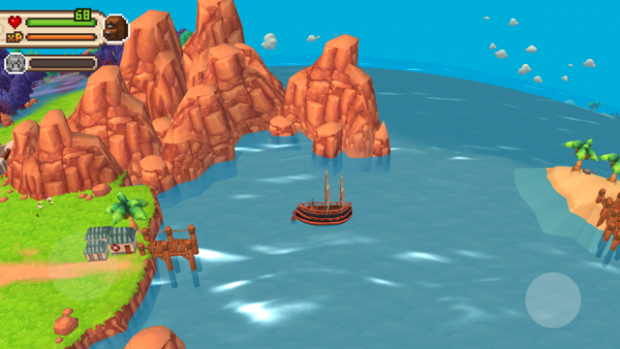 Your view and interface with the game will be changing from locale to locale, and while you aren’t necessarily getting thrust into a new situation each moment like a Wario Ware type of situation, you will need to be capable of adapting to new controls and gameplay as you progress further and further into the game. The entire gimmick of Evoland is that as you progress in the game, the generational technology of the game shifts. So at one point you will be looking at a screen that might remind you of an original NES or gameboy game, other times you might be looking at a PS2 quality 3D rendered environment. That’s basically the breadth of what you will experience as far as video game eras is concerned. Anything within those boundaries you will find well represented in game. You will also find that the game will sometimes be well within standard RPG gameplay limits, but frequently shifts to completely different modes including a card battle system, puzzle solving, bullet hell shooting and much much more. There is a really solid mix of meaningful dialogue and comedic interludes that keep the pace uplifting yet still plausible. Whether the characters are hashing out philosophical differences or dropping 4th wall breaking one liners, you start to see that the game wants to be thoughtful and playful and it works very well. For a game that has so many evolutions, mode changes and overall mutations, it seems like an easy situation to get whiplash in, but that is not really the case. In the first game you would just find a chest, open a chest, and get a new coat of paint on the game without much reason but the sequel spends time explaining things and showing a lot of consideration for why things are happening and why things are changing. Rather than just offering a reflection of old games we love, Evoland 2 tells it’s own story and does it just like those old games did. In spite of graphical constraints and in spite of platform limitations, the story can still be told that is poignant and relatable. The overall gameplay of Evoland 2 is solid. There is not a ton of innovation, but the platforming/action RPG core is very good, if not a little fiddly with the touch controls. I have gone back and forth between using a mfi controller and the touch interface and a controller does bring a lot of ease to otherwise very difficult situations. There were a number of bosses that were incredibly difficult with touch control but I never felt fully blocked or unable to progress without the controller, it is just a more difficult path. I won’t go into detail on each of the side-genres or side-games that this game employs but most of them are a hit, with the notable exception of the card game being a bit of a downer. Some of the references are also a bit hamfisted, like in the Professor Layton style puzzle section. Ok, so a lot of the references are hamfisted, but that’s part of the charm of this game! Also, you should be aware that there are a lot of times you will need to learn a new system in order to move forward and as long as you are like me and really enjoy the variety, it should not cause a problem. The original Evoland has been estimated around a 4 hour play time. Evoland 2 dwarfs this at a big-boy-RPG 20 hours of estimated play time. I think the first game was a sort of test bed and the sequel really shines as a result. Whether you look at dialogue and story line, or implementation of mechanics, or just sheer volume of gameplay, Evoland 2 is not just a huge improvement on the original but also an amazing way to extend your experiences you may have had with those old school games that it emulates. Evoland 2 pulls off something very difficult to do, it keeps it’s own unique feel and functions as a greatest hits anthology. Go get it if you haven’t already!